We offer you a wide selection of professional hair care and beauty products at affordable prices. "Look sensational, feel great - we have something for all lifestyles". Color Revive is a luxury hair care range of non-ammonia temporary hair colouring shampoos and conditioners designed primarily for permanent hair colour maintenance, providing warm shades to enhance and harmonise your hair colour, and bring shine. Color Revive will also enhance natural shades but to a lesser extent. The dyes used are deposited only on the surface of the hair shaft, and with regular use will intensify the colour obtained. If application is discontinued, the colour will gradually fade and wash out with no unsightly re-growth at the roots. Use Color Revive to maintain vibrancy, shine and condition between permanent dye applications. Permanent colour will fade and become dull over time due to U.V. light, harsh shampoos and chlorine in swimming pools. The use of the Color Revive Shampoo followed by the corresponding Color Revive CrÃ¨me conditioner will guarantee an optimal colour and care result refreshing your permanent colour. The colours may be mixed so you may even like to make your own tailor-made blend of colour to suit your needs. Color Revive is highly charged with temporary dyes and ultra-shiny particles of pearlized mica. The shampoos contain a U.V. filter to protect the dyes and the hair from UV- induced fading. The conditioners contain a mix of active ingredients including wheat protein and ceramides leaving your hair feeling soft and shiny. Neither the shampoo nor the conditioner contain ammonia, oxidizing agents, sulphates or alcohol and both are compatible with all hair dyes. Color Revive shampoo is a gentle cleansing colour depositing shampoo which can be used on it's own or preferably after first cleansing with a colour safe shampoo. We advise the use of Color Revive conditioner after applying Color Revive shampoo as this will add further depth of colour, while smoothing the cuticle and improving the adhesion of the dyes. 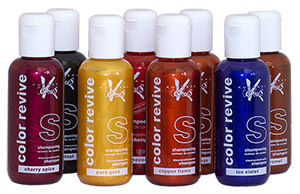 Color Revive is not intended to replace a permanent or semi-permanent dye. It is meant to intensify, correct or harmonise a colour. It has a temporary colouring effect and should be used regularly to obtain a continuous colour. For advice on useage and colour results click on this link: Table of Color Revive Application Results. Warm golden tones to enhance light/medium/dark blonde and medium brown hair. Eliminates unwanted yellow shades in blondes, white-grey and streaked hair. Light golden tones for light/medium blonde and streaked hair. All rights reserved. Copyright © 2007 Zest Street.